Things are warming up in the south of France and that means it’s festival time. Almost every little town has something to celebrate, and in Tarascon, which lies between Avignon and Arles, it’s the story of a saint and a dragon. Religion plays a major part in shaping many cultures, and in France, that religion is Christianity. It’s said to have entered France by way of Provence around the year 43 AD. Legends tell of a group of first century Christians who were rounded up and expelled from the Holy Land. They were put in small boats, without oars or sails, and set adrift on the Mediterranean Sea. 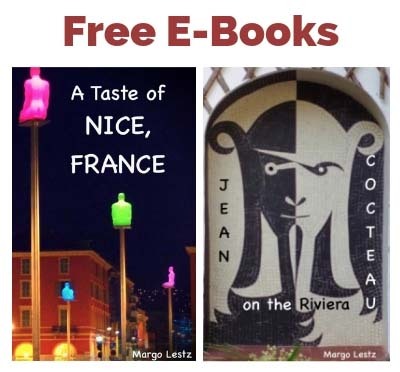 It was meant to be a death sentence, but their boats miraculously washed up on the shores of Provence where they disembarked and set about preaching their new religion. At that time, on the banks of the Rhone River, between Avignon and Arles, there was a fearsome monster terrorizing the region. It was called a Tarasque, and it was a horrendous creature. It had the face of a lion and razor-sharp teeth. Its body was similar to a dragon, and it had six legs ending in claws so sharp that one swipe could slice a boat in half. On its back was an armored shell, like that of a turtle, with spikes running along it, and to finish off, it had a tail that it used like a whip. This monster killed every living creature that crossed its path: man or beast, on land or in the river. It could shoot fire from his eyes and its mouth, even its breath would burn whatever it touched. Legions of soldiers were sent out to fight it, but because of its impenetrable shell, their spears and weapons were useless. One day Martha wandered up that way and started to preach about miracles. After all, she had seen Jesus raise her brother, Lazarus, from the dead. The crowd was a little skeptical and someone suggested that if she could perform a miracle for them they would surely all convert. They proposed that she get rid of the Tarasque, that dragon that had been eating their kinfolk. Although Martha had been hoping they would ask for an easier miracle, she took up the challenge. Trembling a bit, she started out to meet the fearsome creature. The people applauded her courage, while at the same time pitying her. They never expected to see the poor woman again. Martha came upon the dragon in the middle of his dinner. He was gobbling up a hapless fellow who had wandered too close to his lair. She plucked up her courage and threw some holy water on the Tarasque. His fiery breath was immediately extinguished. Then she held up a cross and that was all it took, the monster was instantly subdued. He meekly lumbered up to the saint like a little lamb. She slipped her belt around his neck and gently led him back to the village. The people couldn’t believe their eyes when they saw Martha leading the dragon toward them. They were filled with fear and hatred and immediately started to throw stones and spears at him. But because of his impenetrable shell, their assaults just bounced off his back and the now docile beast offered no retaliation. The people had so much hostility toward the monster who had killed their neighbors and livestock that they just kept throwing things and shouting at him, cursing him for all the pain he had caused. The poor creature whose character had been completely changed by his conversion, fell down and died of shame for his past actions. The monster situation had been resolved, and no one could deny that was a miracle, so most of the town heeded Martha’s words and converted to Christianity. In honor of this miraculous event, the town, which up until this time had been known as Nerluc, changed its name to Tarascon. The Tarasque found his way onto the city’s coat of arms and there is a stone statue of him near King René’s castle. There’s even a special festival every year in remembrance of this story. The festival was started in 1469 by King René of Anjou. At the beginning it was celebrated on the second Sunday after Pentecost and was seen as a way to ward off evil and floods, for which the Tarasque had been blamed. Of course, in modern times, we understand that dragons don’t cause floods, but that’s no reason to give up a fun festival. The celebration now takes place the last weekend in June, and one of the high points is when the large effigy of the Tarasque is paraded through the streets. He is definitely the star of the show. Unfortunately, I won’t be able to make it to see the Tarasque this year, but if any of you go, I’d love to hear about it. *The story of Saint Martha and the Tarasque has been recognized by UNESCO and placed on the list of Masterpieces of the Oral and Intangible Heritage of Humanity. *The mythic monster has had the honor of having a dinosaur named after him: the Tarascosaurus. 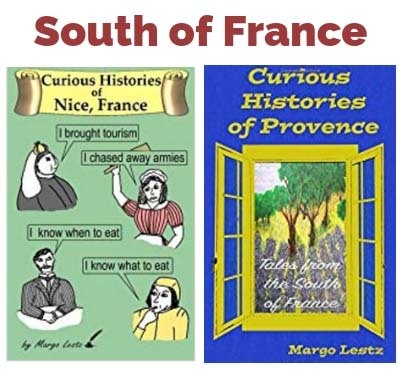 *More About Provence – You can learn more about Provence in my book, Curious Histories of Provence: Tales from the South of France. *Images Sources: 1-5 in Public Domain, 6 from City of Tarascan brochure. Please enjoy another great blog by my friend Margo! Another wonderful piece of research, as usual, beautifully presented. I love getting your posts. It was definitely my lucky day when I met you at the meet-up group in Nice 2 years ago. hopefully I will get back to nice one day; i definitely need to use my French a lot more. Hello Paula, I’m happy that we met at that meet-up group as well. Looking forward to seeing you again someday. Thanks for the kind words. Haha, I sincerely hope not! Are you so sure? Most stories or myths have a kernal of truth. There are quite a few dragon stories to simply just write them off as myth just because they don’t make sense in today’s world. What other dragon stories have you read? Well I am sure that I didn’t harm any dragons when I wrote the story… I would never harm a dragon! 🙂 And I do agree, there must be something behind all the dragon stories. I would love to one day find out what it is. And even this Gaudi house was inspired by a dragon:https://curiousrambler.com/2016/05/26/gaudi-architecture-in-barcelona/. I haven’t visited this area yet, but I am researching it and making plans. It seems there is a lot to see with the “cowboys,” bulls, horses, flamingos… I’ve been exploring your site for ideas. Thanks! The Camargue is one of my favorite places, so you’ll see lots about it on my site. Feel free to reblog if you’d like. Glad to know more about the legends. I was surprised. 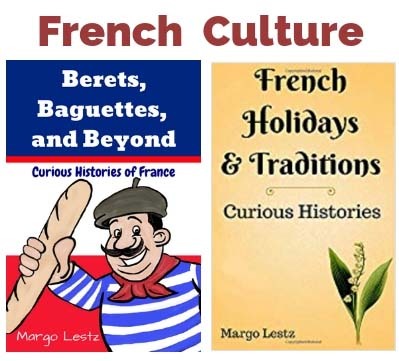 So much to learn about France! Lovely story. Five hundred years of celebrating the Tarasque and as you say, many, many towns, cities and villages all over France [?and the world] continue to celebrate these wonderful legends of derring do – usually involving dragons and monsters. It makes me wonder what ‘new’ legends might be celebrated in 500 years time? Not sure I’ve heard of any dragons being slayed in Villefranche lately!! Marvellous post as usual, thank you. Very Interesting! Where did you get that lovely picture of St. Martha and the Tarascon? Hi Storytime Yoga, Glad you liked the story. The photo is from French Wikipedia: https://fr.wikipedia.org/wiki/Tarasque and is from an 18th century painting. The tarasque lives on as one of the most difficult monsters in Dungeons and Dragons as well. It still has the spiked shell too. Well, now that you know the secret, he shouldn’t cause you any more problems – just throw some holy water on him and hold up a cross.